Murano’s glassmakers held a virtual monopoly on quality glassmaking for centuries and as such it remains the longest lasting centre for glass making in history. During this time they developed, or procured and refined, many processes which we have made reference to in our History of Venetian Glass guide. This glossary describes the individual process, some of the science involved and who the technique or process can be attributed to. This process involves adding micro particles of copper, gold, or chromic oxide to molten glass after which deglassification, during the cooling stage, results in the separation of the particles from the molten mass. This produces an affect whereby the fine particles are suspended in the glass and appear like gold flecks when they catch the light. The root meaning of this word is sometimes wrongly ascribed to avventura (or adventure in Italian), rather than the correct ventura (fortune or chance in Italian), but both descriptions give a good idea of the skilled nature of producing consistent pieces. This process was a closely guarded secret when first developed and refined in the 15th Century, coming back to prominence in the mid 19th century at the glass works of Pietro Bigaglia and then Salviait & C. It is used for beads, vases, and a variety of other objects. Image: Vintage orange and black Aventurina glass beads. This is a cold working finishing treatment using a grinding wheel to mark the surface of the glass. The grindings are made to differing depths and with overlapping irregularity to create a faceted fish scale or hammered metal effect. This is a similar process to incisio but with broader, flatter cuts, as opposed to narrow and deep markings. The process originates from the early 1900s, most notably from the Daum glass works in Nancy, France. In Murano the process was a favourite of Carlo Scarpa at Venini & C., as well as Alfredo Barbini, Lino Tagliapietra, and Davide Salvadore. 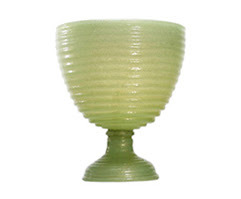 Image: Battuto finish vase in green by Carlo Scarpa for Venini & C., circa 1940. This process results in glass that looks like the semi precious gemstone agate. This quartz stone is characterised by veins or bands of differing colours and this is replicated in this glass making technique. It is produced by mixing colouring agents, generally copper, iron, cobalt and tin oxides, with metallic silver. This is then blended into a fusion of different types of glass which is then mixed further until the desired effect is achieved. This was an historical formula from the 16th century which was then lost only to be rediscovered in 1846 by the industrialist Lorenzo Radi. It was used by Venini & C in the designs of Napoleone Martinuzzi. A chevron is a bead type produced from a cane known as a Rosetta. They were drawn from a hollow cane typically with six thin layers of glass, traditionally white, blue, white, brick red, white then finally blue. This was then ground to produce patterns with five concentric stars with twelve points. The canes were chopped allowing large numbers of beads to be produced from each production run. Later, this cane was produced without the hole and Millefiori canes were born. They were first produced in Murano at the end of the 14th century with the first reference to chevrons appearing in the inventory of the Barovier glass works in 1496. They were one of the core bead types used as Trade Beads destined for West Africa and the Americas. Like most Murano techniques of the time production processes were heavily protected. Today, like seed beads, the production of Chevron beads in Italy is limited due to the influx of less expensive foreign beads, in this case from from India and China. 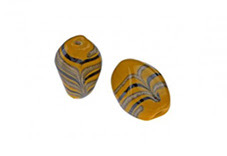 The best known contemporary chevron bead makers are Art Seymour, from America, and Luigi Cattelan, from Murano, Italy. 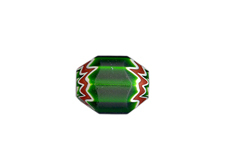 Image: Contemporary Venetian chevron bead produced by acclaimed Italian bead artist Luigi Cattelan. Seed beads created by the Venetian glass bead industry were initially small, opaque and round. The simplest form of beads they were produced from hollow tubes which were then chopped and re-fired for smoothness and colour. Typically sold in shanks pre-strung or by the kilo. They were used to decorate textiles and clothing, as well as for necklaces, hair combs and earrings. The peak of their production in Murano was in the early 1900s when these beads sustained the Venetian glass industry. Today the industry is virtually non-existent in Italy, as the market is now dominated by Japanese and Czech distributors, offering a much larger selection of sizes, colours and cuts. This is a cold working treatment in which the surface of the finished article is corroded by placing it in to a bath of diluted hydrofluoric acid or ammonium fluoride. The result is a rough layer on the items surface. By varying the temperature of the solution, the time in the bath, and the composition of the acid it is possible to obtain varied effects. It is also possible to mask areas of the glass surface using wax or paraffin to protect areas from the acid and to keep them bright. 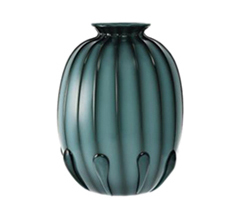 This technique was introduced by the French at the beginning of the 20th century and found its first applications in Murano in the 1930s in the designs of Carlo Scarpa for Venini & C., and the vases and figures of Flavio Poli for the Seguso Vetri d'Arte firm. Image: Seguso Vetri d'Arte bowl with a corroso surface. Produced in Murano, Italy circa 1940 whilst Flavio Poli was artistic director. A clear, highly malleable, virtually colourless Venetian glass whose discovery is attributed to Angelo Barovier in the mid 14th century. It got its name from its resemblance to natural rock crystal. Aside from its clarity the other benefit of this discovery was that it could be blown into vessels with very thin walls which saw glass move away from the heavy designs of the time. A process from 16th century Murano used to make items with an opaque white or coloured glass lined core. It was achieved by laying thin rods of clear glass alongside rods of the desired colour, which traditionally would have been white opaque glass. They are fused together in the furnace and then moulded into a cylinder. After which they can then be blown and shaped. This process has three additional patterns depending on how the filaments are twisted and aligned. With mezza-filigrana, rods with one filament are used. With vetro a reticello a diamond shaped pattern is created by twisting two halves of an object in opposite directions while heating and distorting the straight lines of the filigrana rods, creating a diamond mesh pattern. Finally vetro a retortolio consists of two filaments twisted into a spiral. All the most important Murano glass factories used this technique. 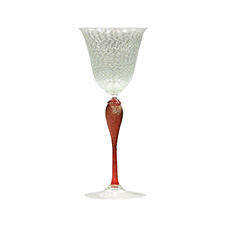 Image: A clear glass mezza filigrana wine glass with grand shaft, red toned with gold, by Seguso Vetri d'Arte circa 1985. A process used to create a cracked appearance in a piece by lowering the hot glass into cold water for a few seconds and then placing the item back into the heat of the furnace. The sudden cooling of the surface area whilst the core remains molten forces a non uniform contraction of the surface causing fine cracks which are then sealed and secured by the reheating of the surface This process was in use from the 16th to the early 18th century primarily in the production of glasses, bowls and beads. It then came to prominence again in the 20th century with craquel effect glass light fixtures. Particulalry noteworthy in this regard are the chandeliers produced by Fratelli Toso in the 1930s. A multilayered glass plating technique, from the 1920s, where different layers of glass are placed over each other before being incased in a final cristallo or transparent coloured layer. This process provides great flexibility in design and finished plated pieces may be a single colour or include additional processes such as sommerso. It was a process quickly adopted up by all the most important Murano glass factories from the 1920s onwards, including Venini & C., Fratelli Toso, Vetreria Artistica Barovier & C. In large pieces it can create a great visual impact and these are much sought after. 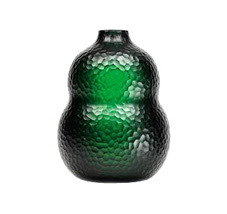 Image: Green lattimo incamiciato green glass vase with vertical stripes and applied drops. Produced by Venini & C., circa 1928. Like battuto this is a cold working finishing treatment using a grinding wheel. In this case the lines are narrow but deep and linear in fashion. In Murano the process was a favourite of Carlo Scarpa at Venini & C., as well as Alfredo Barbini, Lino Tagliapietra, and Davide Salvadore. 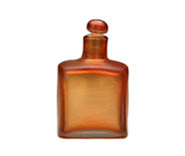 Image: An orange glass stoppered bottle with horizontal inciso produced by Paolo Venini for Venini & C. circa 1950. Is the process of fusing together many different pieces of coloured glass while pliable and then forming them into a single object usually a vase or goblet. It originated in the Islamic world before being adopted and adapted in Murano. It is an expensive technique requiring great skill on the part of the glass maker, as the individual blown parts need to be identical in shape, or circumference, prior to being warm jointed together and shaped into the end form. 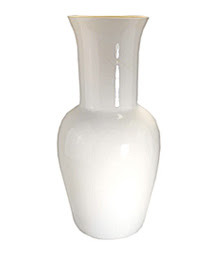 Notable forms being the vases and lighting created by Thomas Stearns in the 1960s for Venini & C.
Refers to an opaque milky white glass produced in the mid 15th century to imitate porcelain, allowing direct competition with real porcelain pieces from China. At this time it was particularly useful for manufacturing objects decorated with multicolored enamels and was opacified using tin oxide or arsenic. The word originates from latte meaning milk. The process fell into disuse only to be revived in the 1920s by the key glassworks of Barovier & C., Venini & C., and MVM Cappellin & C. The latter was the first to use it without the addition of other colours for a series of geometric vases exhibited at the 1927 International Exhibition of Decorative Arts in Monza. In the 1950s it was adopted by almost all the glass furnaces on the island, being used more diversely, including in the famous Commedia dell'Arte figures by Fulvio Bianconi for Venini & Co. In modern production the opaque effect is created by adding calcium and sodium fluorides to the molten glass mix in the form of fluorine compounds such as cryolite or fluorine spar, as well as zinc oxide and alumina. Image: A mould blown lattimo vase attributed to Tomaso Buzzi or Carlo Scarpa for Venini & C. circa 1932 to 1935. A technique in which large or heavy objects are produced without being blown because the molten glass is too heavy or dense to handle creatively. The glass is therefore shaped, moulded, or formed whilst the glass is hot and malleable. This process is often used for thick glass sculptures. Is one of the oldest and most well known techniques still in use in Murano. It is used to describe small mosaic cross sections of glass. The process involves stretching and shaping regular arrangements of multicoloured rods of glass. Normally the colours are added and a shape is created before the molten glass is stretched into a long thin cane. The cane can then be cut to size for use as beads or placed on a gather of molten glass (pea) for inclusion into murrina paperweights or blown vases. One of the oldest techniques used in glass making dating back to Roman times and rediscovered in the 1800s. Thin sections of glass rod are placed together to form a pre-designed image before being fused together and then formed and moulded into shape or even blown. The rods are often designed to create a floral or geometric design. Is based on the same principle as lattimo glass but takes it a stage further and as a result is one the most difficult glass making techniques to master. A coloured opaque glass is made by adding clear or coloured crystals to molten glass until it becomes similar in appearance to ceramic. Because of the complexity and mixed results this process was only been utilised by a handful of glass works at the outset of the 1900s, namely Venini & C. and MVM Cappellin & C.. Post war it was adopted more widely particularly when glass figures became fashionable in the 1950s. 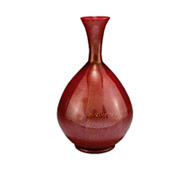 Only the American designer Thomas Stearns made large items entirely of vitreous paste for Venini & C.
Image: A red gather fused burst gold foil iridised pasta vitrea vase produced by Carlo Scarpa for MVM Cappellin & C. circa 1929. A rare process developed by Carlo Scarpa for Venini & C in 1940. It sees the fusion of glass to the surface of a hot item that is still on the blower's pipe. Small balls of coloured glass are applied and then pulled over the surface of the blown object to leave a slight colour trace which is reminiscent of an artists brush or pennellata. This process is repeated until the entire surface of the object is covered. Often opaque glass in various shades of yellow, orange and red is used to obtain a slightly iridescent effect on the surface. Image: A pennellate bowl by Carlo Scarpa circa 1942. 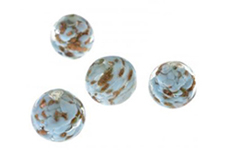 These beads are often called wound beads because molten glass is wound around a mandrel to form the bead. Originally this was a ferrous mandrel covered with a mixture of silica and clay which gave the bead some room for contraction when it cooled and helped with removal of the bead from the mandrel. In 1935 copper mandrels were introduced into Murano by the Moretti glass works and soon became the standard tool for making lampwork beads. They proved more economical as the mandrels did not need to be coated and breakages were reduced as the copper mandrel was cut off just below the bead and the cut off section was placed in nitric acid which etched the copper from inside the bead. Today, bead makers in Venice and Murano still use both methods, using stainless steel with a bead release material for more delicate beads, or for beads with silver in them which tends to turn dark if it comes into contact with acid. A technique used to create an almost opaque glass through the inclusion of innumerable bubbles or puleghe in the glass. This process was invented by Napoleone Martinuzzi in the late 1920s, whilst he was artistic director at Venini & C. The bubbles are created by adding salts, generally sodium carbonate or bicarbonate directly into the molten glass. The salt breaks down due to the heat, which releases gasses in the form of carbon dioxide, which disperse within the glass forming bubbles as well as giving the glass an irregular surface texture. This has remained an important process from the 1930s to the present day, with Vetreria Artistica, Barovier & C., Seguso Vetri d'Arte and others producing vases, figures and the famous blown and hand-shaped glass cactuses. Twenty five years later during the 1950s Dino Martens made the famous pittorici vases for the firm of Aureliano Toso, whilst Gae Aulenti was combining metal and pulegoso glass for Venini & C., in 1995. Image: A pulegoso lamp produced by Ercole Barovier for Artistica Barovier circa 1930. A technique using coloured threads or small artistic designs that are then submerged into various crucibles of colourless transparent molten glass to form a multi layered or multi hued effect. Once again Carlo Scarpa fro Venini & C. was at the forefront of this process from the mid 1930s. He made use of a layer of coloured glass along with gold leaf and frequently air bubbles which he would capture in a thick layer of transparent glass. This technique was quickly taken up by many of the other Muranese glass factories. Image: Vintage Venetian baby blue sommerso lamp worked glass beads with blue opaque glass and aventurina, circa 1955. Created by fusing together pieces of glass of almost random shapes or sizes before blowing or working into a finished object. 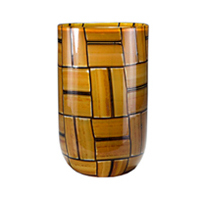 Image: Barovier & Toso clear glass and fused ochre brown structured glass vase circa 1957. 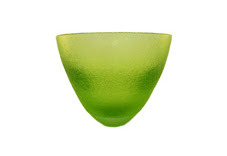 A multi coloured glass invented by Carlo Scarpa for Venini and C. in the late 1930s. Based on the filigrana process, very thin rods of coloured glass are fused together to create an alternating pattern of stripes and then blown. 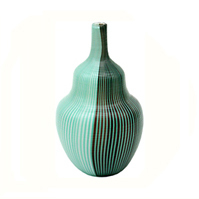 Image: Paolo Venini tessuto matte finish vase with mint green, brown and white stripes with horizontal texturing, circa 1985. A type of glass cane made by assembling a bundle of different coloured rods and heating them until soft. The bundle is then attached to two metal pontils or metal rods before being drawn out and elongated. During this process the bundle is twisted to produce a spiral pattern. This process was originally known as vetro a retorti, but was renamed in recognition of a Venetian dealer called Antonio Sanquirico, who in the 1830s encouraged the revival of this and other traditional techniques on Murano. 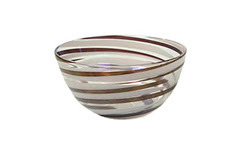 Prior to the start of the 20th century, years of simply repeating traditional glass forms had caused the quality and popularity of Murano’s blown glass to decline dramatically. Then, a succession of innovative glass blowers began to reinvigorate Murano as a centre for art glass, abandoning repetitive production and challenging tradition with inventive techniques, whilst embracing contemporary styles and tastes. 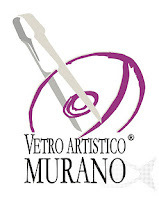 By the 1950s, Murano glass had redoubled its historical importance and was again leading the world in glass making. But with two World Wars and the economic and political uncertainty that follows any conflict it was not an easy journey. By the turn of the century the Fratelli Toso glassworks had a fifty-year heritage to rely on, being primarily recognized for its works with murrina. But even with this strong base the outbreak of World War I interrupted the progress of both Fratelli Toso, and the much anticipated recovery of Murano glassmaking in general. The Salviati & C. glassworks (by now without Antonio Salviati and having been renamed Compagnia di Venezia e Murano), had arguably a greater international reputation and grounding than Toso, and yet it ceased production in 1909. This followed the sale of the company by its British backers, archaeologist Austen Henry Layard and antiquarian Sir William Drake, to a Venetian businessman named Tosolini, who owned a number of shops along St. Mark's Square. Under his management, the company stopped production and focused solely on commercial distribution from these retail outlets. It was left to a partnership between two Milanese outsiders to bring about the change that had been promised in Murano at the turn of the century. Paolo Venini and Giacomo Cappellin came to Venice from Milan with the express intention of rejuvenating the Venetian glass industry. In 1921 they formed Vetri Soffiati Muranesi Cappellin, Venini & C.
Paolo Venini was a lawyer with no experience of glass blowing, but he did have an entrepreneurial spirit, an openness to new ideas, and a willingness to collaborate with other artists and specialisations, such as architects. Giacomo Cappellin, a Venetian by birth, was an art dealer who owned and operated an antique shop on Milan's via Monte Napoleone (now famous as the premier street in the Milan fashion district). The company’s focus was to be the modern design trends that were sweeping the world and that had been the centre for debate in artistic circles in Milan. The designs were to be along simple lines, using the thinnest of transparent glass, and with delicate colours, all contrasting strikingly with the fashion for heavy decoration of the time. They brought in Vittorio Zecchin as artistic director and began production. Their new designs were immediately recognized both in Italy and abroad. Much of this success was down to the fact that from the outset Venini’s main goal was to expand his company’s influence overseas. To achieve this he sought the collaboration of the most talented artists of the time. He also worked alongside his designers, with the aim of directing taste whilst personally checking every collection produced under his name. His confident direction, along with the fine quality of the items produced assured the glasshouse this critical and commercial success. With the confidence that this gave the company they opened sizeable retail shops in Venice, Paris and Milan. However, the partnership didn’t last long, and in 1925 Venini and Cappellin parted company after just four years, to establish independent glassworks. Paolo Venini started Vetri Soffiati Muranesi Venini & C. in 1925, hiring Napoleone Martinuzzi as manager of his new venture. At the time Martinuzzi was a sculptor overseeing the Murano Glass Museum. He developed the pulegoso technique which in 1930 proved to be a watershed moment, since opaque glass completely broke with tradition and opened up a whole new direction for creative thinking and experimentation. The first vases made by Venini with this new material were hailed by the critics who saw the Murano glass industry rising up again. In turn Giacomo Cappellin also opened a new furnace in 1925, Maestri Vetrai Muranesi Cappellin & C., retaining Vittorio Zecchin as artistic director as well as the majority of the master glass blowers from the previous firm, notably Diego Barovier, Attilio Moratto, Malvino Pavanello and Giovanni Seguso. In 1926 Zecchin left the firm to be replaced by a then unknown architect, Carlo Scarpa. This firm was to close in 1932 due to financial mismanagement, but not before Scarpa had made a reputation for himself that in time would see him become one of the most innovative artistic glass workers of the century. His first few years at the firm saw production continue to be influenced by Zecchin’s designs whilst the new company found its feet, but Scarpa then found his own direction with the re-introduction of historical techniques, the use of opaque glass, and bright colours. The closure of the Cappellin furnace coincided with the departure of Napolene Martinuzzi from Venini to set up his own furnace in partnership with Francesco Zecchin, an engineer by education, who had also worked at Venini’s. This left an opening at Venini for an artistic director which Scarpa filled. His use of innovative techniques flourished during his time at Venini & Co. 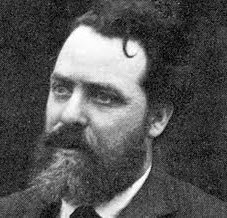 In addition to creating new ways to work with molten glass such as sommersi, he developed new surface treatments including corroso, battuto, fasce and pennellate. Paolo Venini also started to take a more active role in the day to day operations of the glassworks and began co-designing works with Scarpa. His diamante glass pieces date from 1936, and he created the murrine romana in collaboration with Scarpa. Following the war, he created bottles with brightly coloured stripes, vessels in mosaico zanfirico and mosaico tessuto, windows in vetro mosaico, and battuto vessels. In collaboration with Fulvio Bianconi, in the early 1950s, he created vessels such as the fazzoletti, or handkerchief vase, which is a classic example of the production of the time and were enormously successful. Another entrepreneur and designer of note, who rose to prominence in the 1930s, was Ercole Barovier, son of Benvenuto Barovier. With his brother, Nicolo, they took over the creative direction of their father's company, Vetreria Artistica Barovier & C. In 1939, after the brothers went their separate ways, the company was renamed Barovier & Toso C., after Ercole brokered a successful merger with Decio and Artemio Toso who were now managing the Fratelli Toso. Over the course of his 50-year career, he invented numerous decorative techniques which contributed significantly to the rejuvenation of art glass. In the 1920s Barovier was known for his work with murrina and the totally original primavera glass collection. He spent much of his time during the 1930s experimenting with new multi-coloured effects, finally perfecting a technique he named colorazione a caldo senza fusione. In the post war period his interest turned to traditional techniques and which he would reinterpret. 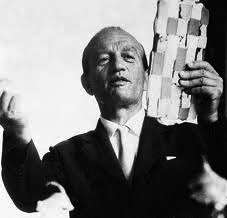 During the 1950s and 60s he presented new interpretations of the tessere technique. It was through Pauly & C., a company born in 1903, and a series of mergers and acquisitions that the early work and designs of both Salviati and Cappelin were returned to production. The company was formed by Emilio Pauly, Alessandro Hirscber Hellman, Vittorio Emanuele Toldo and Ernesto Graziadei. In 1919, Pauly & C. and Compagnia di Venezia e Murano were both purchased by the Milan Società Anonima Sanitaria, which subsequently resold them the following year to Gaetano Ceschina of Milan. This newly merged company, now renamed Pauly & C. – Compagnia Venezia Murano, resumed production of glass on the island of Murano in 1925. 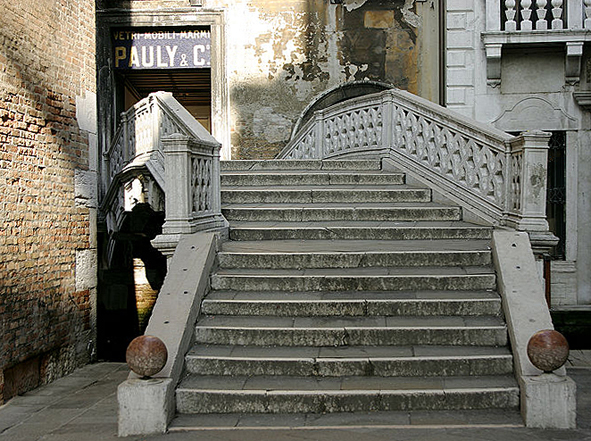 The entrance bridge to Pauly & C in Venice as it stands today. 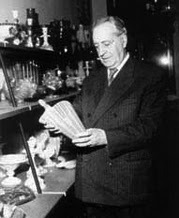 The company grew again in 1933 with the acquisition of Maestri Vetrai Muranesi Cappellin & C. (or MVM Cappellin), the glass company formed in 1925 by Giacomo Cappellin following his split away from Paolo Venini. 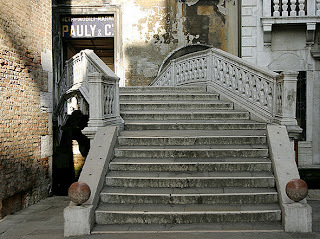 This gave Pauly & C. the rights to the works and designs of MVM Cappellin, including the historicaly important early designs and techniques of Vittorio Zecchin and Carlo Scarpa. Through the efforts of all of these firms, and their master glassmakers, Murano glass survived the test of two world wars. With new market places opening up through increased travel and tourism the 1950s and 1960s were to be an artistically memorable period. Production also moved into new areas with the growth of specialist lighting companies, as well as jewellery producers, and high end glass sculptors and artists. Other areas were also largely lost to Murano due to inflated productions costs. Bead making being one such industry where production shifted to Japan, India and China, with only the Czech Republic retaining a strong market presence in Europe. The few bead makers that have survived in Venice and Murano have had to find a niche at the high end of the market. 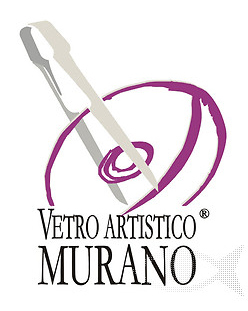 The next challenge for Murano, and indeed for any prestigious products, proved to be the problem of counterfeiting. In the 1980s onwards, factories in Asia began producing 'replicas' of classic Murano glassware, vases, and millefiore objects, including beads. Over the next twenty years the sophistication of the production processes began to mirror those of Murano but at a fraction of the labour costs. By way of an example, the bead making industries in India began making rosetta or chevron beads in the mid 1980s using pre-prepared sections of hot strips of glass that were then composited together to form a cane. Due to the limited nature of this manufacturing process these 'impostors' could be identified by the misaligned points to the chevron stars. Ten years in later in China chevron beads were made from moulded star canes in exactly the same manner as Venetian chevron beads and it is now difficult to tell the Chinese version from a bead produced in Murano. Today, some of the most important brands of glass in the world are still produced in the historical glass factories on Murano. Most notably Barovier & Toso, Venini, Pauly and Seguso. With Barovier & Toso officially recognised by the Guinness Book of World Records as one of the 100 oldest companies in the world, formed in 1295. With this depth of history and such a long list of notable master glass makers it is only fair to forgive them the quality of the glass souvenirs they sell to tourists following their strictly timetabled furnace tours!